Pinellas County Voters are being asked to approve a law (The GreenLight Plan) that would provide for an open ended 1% increase in the County sales tax. 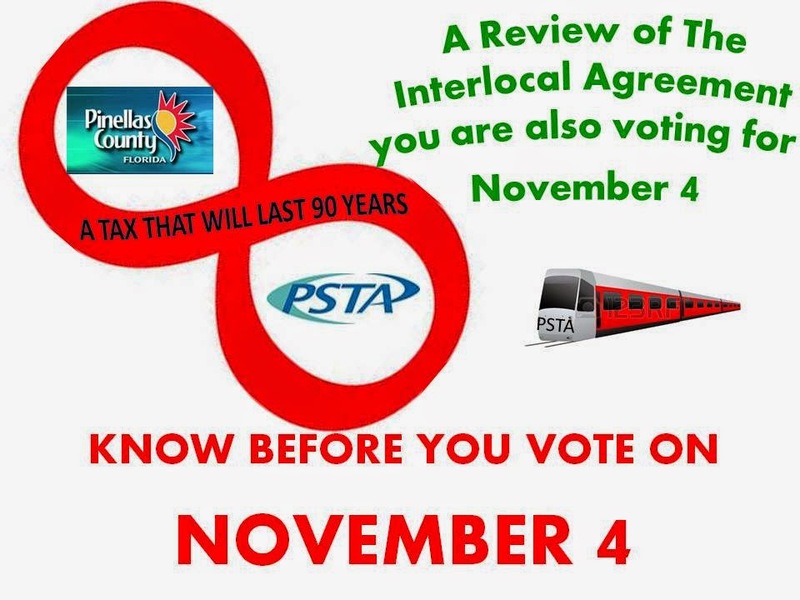 Due to pressure from opponents of the Greenlight plan and the Sales tax ordinance, the Suncoast Transit Authority and the Pinellas County Commission found it necessary to develop the Interlocal Agreement before the election to add some direction to how the revenue from the 1% sales tax will be spent and to attempt to add some clarity regarding the suspension of the current PSTA Ad valorem property tax. The text of the Agreement appears in italics My Comments appear in Bold regular text. This is a feel good Section to assure both parties they have done everything possible to make this Agreement as flexible as possible. Note that the County establishes itself as the author of the Agreement, while the actual GreenLight Ordinance was authored by the PSTA. No indication here who must approve any written agreement that changes the original Agreement. Standard contract language protecting the Agreement from any one Section being held invalid by any court. Note also that this Section provides for termination of the Agreement should the County not be able to impose the sales tax or that the proceeds of the sales tax cannot legally be distributed to the PSTA. subsequent ordinance, resolution or other proceedings of the Board of 12 Commissioners of the County, and the County shall not take any action which will adversely impact its obligation and ability to levy the Surtax and to pay Net Surtax Proceeds to the PSTA to be used as contemplated in this Agreement and in the Ordinance. This Section protects any bond issuers and holders where the Surtax revenue is pledged to the bonds and that will be required for all bonds related to the GreenLight Plan. This Section prevents the County through its Board of Commissioners and the County directly from taking any action that affect collecting and payment of the sales tax to PSTA for servicing of the Bonds. In other words, once sales tax revenues are pledged to , "notes, loans, lines of credit, other evidences of indebtedness, lease agreements, concession agreements" the County cannot stop the sales tax or refuse to pass the sales tax proceeds to the PSTA. This Agreement allows for these bonds to be in place for 50 years with two twenty year renewals. That is a total of 90 years. If GreenLight passes, you can bet that the very first thing PSTA will do is establish the Bonding and lines of credit to tie up as much of the sales tax revenue as they can to prevent any legal action from preventing encumbering the sales tax proceeds. This is the Section that ties up your tax dollars and assures that the tax stays in place. GreenLight is a 90 year mortgage on the future of Pinellas County, and you sign it when you vote yes.